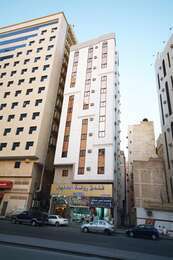 Ajyad Hospital located in Ajyad Street, Al Hajlah District, Mecca. Ministry of Health has allocated this hospital to receive the emergency cases of patients and injured at the Holy Mosque and the central area surrounding it. Ajyad Hospital is equipped with the latest technologies and medicines to treat the chronic diseases affecting the visitors and pilgrims throughout the year as part of continuous endeavors to render the best health services for the Guests of Allah, and equipment to isolate the suspected cases or those infected with any infectious or epidemic disease, this comes as part of ongoing attempts to prevent the spread of the infection to the other people and to protect the pilgrims from diseases. Ajyad Hospital has bed capacity to 52 beds distributed as follows: 32 beds for emergency cases, 20 beds for inpatients, 12 beds for intensive care and 8 beds for cardiac intensive care, the hospital’s administration also supervises two other health centers located inside the Holy Mosque to provide swift ambulatory and therapeutic services for the pilgrims and visitors before being transported to hospital if necessary, and the number of the hospital’s staff including physicians and technicians amounts to 54 physicians, 141 nurses and 30 technicians specialized in laboratories, radiation and pharmacy. As for the health centers, there are 11 physicians (including 3 specialists and 8 residents), in addition to 18 nurses working in shifts throughout the day. Makkah Health Affairs General Directorate annually increases the number of physicians, technicians and nurses in the Holy Mosque’s hospital and health centers during Hajj and Umrah seasons in order to cope with the huge number of pilgrims and visitors and to provide quick and urgent services for the Guests of Allah. The most common cases received by Ajyad hospital, there are three categories (minor, mild and serious cases), the hospital’s physicians provide ambulatory services and treatment for the minor cases suffering from scratches, wounds and simple fractures until they leave the hospital. Regarding the mild cases, those suffering from some chronic diseases such as mild heart disorders, they are hospitalized in the general intensive and cardiac care units. As for the serious cases, whose health condition requires urgent surgical intervention or intensive medical care, the hospital deals with them by providing urgent ambulatory services and immediate transportation to the nearest general or specialized hospital or to King Abdullah Medical City in Makkah.